Sony has said that it still believes that compact cameras are doing well, despite the overall down turn in sales as seen across the market in recent months. Speaking to TechRadar, Paul Genge from Sony UK said, "The market is in a state of flux." Last year, sales of compact cameras dropped by around 30%, with many suggesting the increasing capabilities of cameraphones such as the iPhone 4S having a big impact on sales figures. "The low end market is quite consolidated now," Genge continued, "There's a number of players that have withdrawn from the market, and perhaps there isn't the innovation and most desirable features in that lower end." That said, several companies have seen an increase in sales of higher end compacts, with both Canon and Nikon recently claiming to have seen sales increases. "With the better cameras, the (ones that cost) £150, £200 upwards, people get a lot of improvement in the zoom, in the capability of the camera, there are some very very versatile cameras now in that DSC arena," Genge said. "I think DSC (digital stills camera) is in a pretty healthy state actually." Genge also said that he didn't think Sony was particularly threatened by the mobile phone arena. 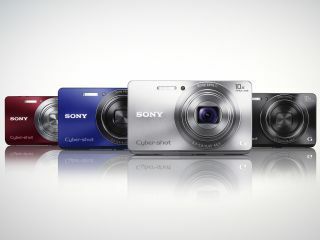 "There is always a reason to buy a digital compact camera and take it out on those special occassions," he said.